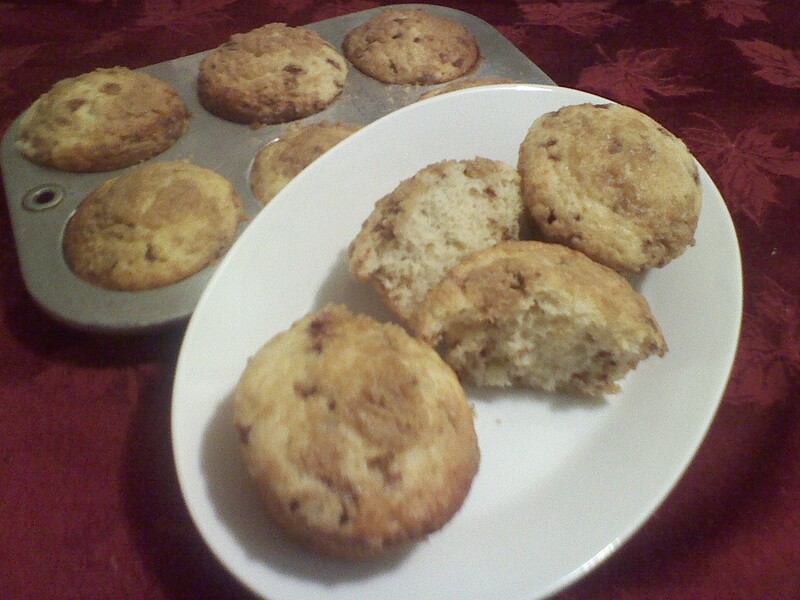 I made mini Cinnamon Muffins today they were super delish. Great with some coffee or a glass of milk, and if you warm it up again yoou can even add a scoop of vanilla ice cream with some caramel sauce drizzled on top. What is something intersting you have had with a muffin? Forget the ice cream…these would be fabulous for breakfast! Do you, perhaps, feel like posting the recipe? 1) Sift together flour, sugar, brown sugar, baking powder, salt, and cinnamon. 2)Combine egg, oil, and milk, add to dry ingredients. Stir just enough to moisten. 3)Fill greased muffin tins 2/3 full. Here’s a recipe for my favorite muffins – they’re low fat but full of healthy ingredients that make them filling and nutritious, not to mention moist and delicious. I spread mine with a little low-fat cream cheese. Makes a great start on the day. Preheat oven to 400°F. Spray twelve 1/3-cup muffin cups with PAM. Combine first 6 ingredients in large bowl and stir to blend. Whisk buttermilk, applesauce, maple syrup, brown sugar, vegetable oil, egg and vanilla in medium bowl until well blended, add raisins. Add to dry ingredients and stir just to incorporate (do not over-mix). Divide batter equally among muffin cups (batter will reach top of cups). Optional: Sprinkle tops with coarse raw sugar. Bake for 28 minutes. Cool on rack.